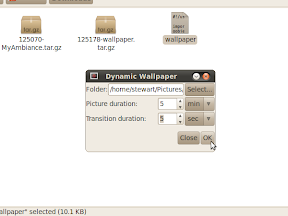 A popular feature in other OS's and one quite often requested in Linux, is the ability to cycle through a directory of images as your desktop background. 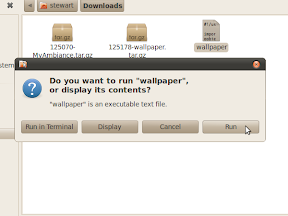 Gnome and therefore Ubuntu actually do support this already and have for a long time, however its not easily configured in the GUI like setting a static wallpaper is. If you go to your appearance preferences and change your background, you may notice a stack of images. This is the 'Cosmos' wallpaper. It is an XML file containing the paths to multiple images. To make your own slideshow, you need to copy this XML file and edit the image paths to the locations of the files you wish to display. Simple enough when you know how to do it, but a bit tedious to say the least. Today I will show you step-by-step how to create and apply your own wallpaper slideshow, and to make it really easy for you I have created a utility to automate the process. 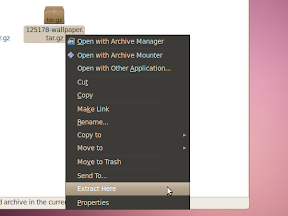 Hopefully Gnome will incorporate a similar utility directly into the Appearance preferences in future release. Very cool. i have been looking for something like this for awhile. and its a really good tourtorial. Thanks a lot. I had been working for a few hours to try and get a desktop slideshow. I had tried the xml method, but it wasn't working for me. I downloaded Wallpaper Slideshow and less than 5 minutes later I had a desktop slideshow. Thanks again. I'm a noob who just started using Ubuntu Lucid and I am really happy with the way the community helps people like myself to get started. I am perfectly sure though that it does. I tried to add the cosmos folder used as a default slideshow and that worked fine. Any help is very appriciated. ok, sorry for wasting your time, I hadn't named the files .jpg in the end... 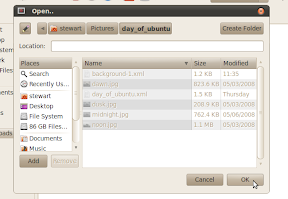 I was confused when I saw the folder interpreted the file as JPEG-file and thought it just hid the file-ending. When i renamed the files in the folder by adding .jpg/.png it all worked out. THX for a great little program. hi this worked great but when i tried to go back and change time duration the program would not run,I've also deleted everything to start over but now I don"t have a cool background and after new download it still won't run.Any help would help Thanks and great work!